LATAM Brasil flight JJ8115 was hit by ground fire while on approach to São Paulo-Guarulhos Airport in Brazil. The aircraft, a Boeing 767-316ER, operated on a regular passenger service from Barcelona, Spain. It was approaching runway 09R about 08:35 hours local time when it was hit by gun fire. Photos show a 7,62 mm wide bullet lodged in the left hand slat of the airplane. 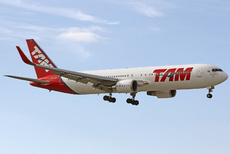 Later that day the aircraft was ferried to a LATAM maintenance facility at São Carlos Airport (SDSC) for repairs.